Capital.com is a CFD broker owned and operated by Capital Com SV Investments Ltd, a Cypriot firm registered under number 354252, and regulated by the CySEC under licence number 319/17. Capital.com is also authorised by the British Financial Conduct Authority (FCA) under reference number 793714. If you’re looking for huge leverage, keep looking because this is not the broker for you. The highest leverage you can get as a retail client is 1:30 for currencies and that is due to ESMA rules, which are meant to protect you. Professional clients can use leverage up to 1:200 but there are certain requirements you need to fulfil in order to be classified as a professional client. The prolific Bitcoin is available to trade on a fully regulated and trustworthy broker. Lately tons of brokers have started to offer Bitcoin trading but many of them are unregulated and – I have to say it – shady. It’s a great chance to see a regulated CFD broker that offers Bitcoin and many other altcoins. Just remember that Bitcoin trading doesn’t fall under the CySEC regulation. At first look I couldn’t find any red flags, so this broker seems legit, with active regulation licenses from two major financial watchdogs (CySEC and the British FCA) and enough transparency to make them trustworthy. They offer information about three of their addresses and about their Directors, which by the way check out from various sources. However, the company went live in mid-2017 so they are fairly new to the scene, so some caution should be used, as with any investment venue. Notice: We found 2 Brokers ranked Higher in your country. Check out our Top Rated Brokers. Should You Open An Account With Capital.com? The company went live somewhere in the middle of 2017 and although they offer a web-based platform, they are also pretty heavily focused on mobile CFD trading. Both types of platforms (web and mobile) are easy to use and the website itself is well built, with easily accessible information and tons of education material. Deposits start at 100 USD and Capital.com actually recommends you start with a minimum deposit before making larger investments. This is a 180-degree change from the “old” Binary Options brokers that recommend you to start with 2K or more. Depositing low in the beginning is actually the smart thing to do and if they allow you such a small amount, why not do it. The education section offers online courses, which are actually helpful to a beginner, not just a rant about how much money you can make and how easy it is to trade. They also have a section dedicated to Daily market updates, including Bitcoin news but also fiat currency, commodities and stocks updates. Let me tell you, that’s a lot of content and it is really updated every day, so kudos to them. Overall Capital.com looks and feels like a well-oiled machine and nothing like a scam. I like the large amount of information available on their website and I like they show constant signs of improvement. They’ve started out with a very basic trading platform and a lot of emphasis on mobile trading but now they offer traders a complex web-based platform (on top of the mobile ones) and have added an FCA license alongside their pre-existing CySEC one. Capital.com listed address is 6th floor, Lophitis Business Centre II, 237, 28th October Street, Limassol, Cyprus PC3035. They also have a UK branch: CAPITAL COM (UK) LIMITED, located at 4th Floor 64-66 Vincent Square, London, United Kingdom, SW1P 2NU. The marketing team is located in Gibraltar, at Unit 5.24, World Trade Centre, 6 Bayside Road, Gibraltar GX11 1AA. So far the only complaint we could find was coming from a client who says that “due to lack of experience and not reading the small print, I lost almost 700.00 pounds in one day”. Look, I am sorry for the loss, but trading is not for everyone and if you are not prepared to put in the work, you cannot complain afterward. Other than this, the internet is pretty much blank when it comes to complaints against Capital.com. There are no bonuses or promotions currently offered by Capital.com. They are regulated by CySEC, which is an authority that clearly expressed their disapproval regarding bonuses, so that is probably the reason why you won’t get a bonus from Capital.com. The processing time is usually 24 business hours and the methods are credit/debit cards, wire transfers and a multitude of e-wallets including Webmoney, Neteller, Skrill, and many others. There are no fees for withdrawals. A big focus of the new breed of brokers such as Capital.com is Bitcoin in special and cryptocurrencies in general. 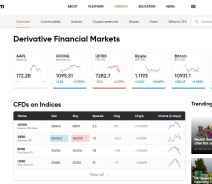 They offer CFD trading on Bitcoin, Ethereum, Litecoin, Ripple and many others (against EUR and USD) but you have to remember that you will be trading CFDs on these assets. You will not buy them! Make sure you understand the difference. The leverage they offer is 1:2, which is low but it protects you from bigger losses. The website is translated into 24 languages, is well built and the information is easy to find. Both platforms (mobile and web) are easy to use and Capital.com also offers Demo accounts. The minimum investment is just 100 USD, which can be classified as user-friendly. 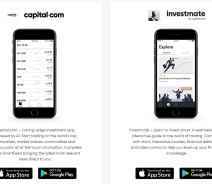 Capital.com offers CFDs on 22 indices, a few hundred stocks, over 15 cryptocurrencies (including but not limited to Bitcoin, Ethereum, Litecoin, and Ripple – all versus USD and EUR), 19 commodities and tons of currency pairs. For retail clients, the leverage goes up to 1:30 for fiat currencies and 1:2 for cryptocurrencies. Professional clients benefit from higher leverage limits. The spreads are floating and vary depending on market conditions. The minimum deposit is just 100 USD and the methods are credit/debit cards, wire transfers, Sofort, iDeal, Giropay, Multibanko, Przelewy24, QIWI, Webmoney, Trustly, Neteller and Skrill. The time to process requests is 24 business hours. Capital.com will not charge any fees for deposits or withdrawals. You will probably have to pay your bank’s charges but that’s normal. Support was fast to respond and answered my questions straightforward. Double regulation from CySEC and the British FCA, Bitcoin news articles updated daily and Bitcoin trading as well as many other altcoins. I had a recent issue with withdrawing funds from my account. The issue was flagged to the support team and I can confidently say that the the support team were doing the best to resolve the issue. This gives me confidence in the platform as issues/bugs are likely to arise on any app on the App Store. When money is involved, patience is always wearing thin on the users end. And finally you allow one tap to open trades, would also be good to see one tap to close trades. Should You Open An Account With ?